Fine teachers know that experience is the source of wisdom; it helps students learn for themselves. Experience never errs. Search for beauty by exploring ugliness. Welcome and learn from other contradictions such as, humility and pride, change and constancy, intimacy and independence, as well as joy and sorrow. Michael Gelb says that the ability to see relationships and patterns, and to make unfamiliar combinations and connections, is the core of creativity. I was motivated to learn more about Gelb’s ideas and to begin applying them. 1. Question: You say in your book How to Think like Leonardo da Vinci that when you were a child your heroes were Superman and Leonardo da Vinci. How were you initially exposed to Leonardo da Vinci, and what first attracted you to him? My grandmother was an Italian painter and she introduced me to Leonardo. His depth and breadth of genius always seemed heroic. He seemed to be the supreme embodiment of human potential. 2. Question: Do you remember why Superman was also your childhood hero? Children are relatively powerless and Superman had super powers. 3. Question: How did you become an expert on the life of da Vinci, and his amazing thinking processes? I’m a passionate student. Many scholars have written about Leonardo’s art, science and other achievements. My work is based on practical questions. What can we learn from him to improve the quality of our lives? How can we apply his methods to develop our own creativity? 4. Question: I want to ask you two related questions. The first is in what aspects of your life do you personally apply the seven da Vincian Principles outlined in your book? The principles apply to all aspects of my life. 5. Question: My second and related question is could you give me a specific example of how your use of these principles has enhanced your ability to attain knowledge, wisdom and new ideas? Since writing “How to Think Like Leonardo” I’ve published 5 more books. I never suffered from “Writer’s Block” because Leonardo has taught me to embrace uncertainty and the unknown. The “Sfumato” Principle is essential to my creativity. When ideas aren’t flowing I do as the Maestro suggests in his notebooks and take a little relaxation. When I return to work the ideas emerge effortlessly. Then I express and explore them applying the principle of “Arte/Scienza”. Just as I advise in the chapter in the book, I make mind maps of the ideas as they emerge. The mind-mapping process makes it much easier to find a ‘Connessione” between ideas. 6. Question: You make some interesting observations about our education system tending to teach students to find the “right” answer. You also say that academic training, even a master’s degree in business, can cause us to have a “real-life learning disability”. So, should we conclude that in general our education has tended to make us less creative, innovative and inventive than we are innately capable of? Let me put it this way, it would be an improvement if schools nurtured the thinking skills that make creativity, innovation and invention possible. 7. Question: I’ve read other authors who recommend we observe and learn from nature if we want to be creative and innovative. You say that finding illustrative metaphors in nature was also one of da Vinci’s favorite techniques. How do you advise we develop and sharpen those skills in order to become more innovative and inventive? Practice analogical thinking and surround yourself with natural beauty. 8. Question: Could you please explain a bit further what you mean? Plato said it best. He wrote "For he who would proceed aright”, (that is, in a right way) ...”should begin in youth to visit beautiful forms...out of that he should create fair thoughts; and soon he will of himself perceive that the beauty of one form is akin to the beauty of another, and that beauty in every form is one and the same." 9. Question: You say that Leonardo da Vinci always had his notebook with him to jot down ideas, impressions and observations. Why is this useful for someone who has an inquiring mind? The simplest answer is to make sure you remember your observations and insights. 10. Question: In your book you state that “confusion endurance” is the most distinctive trait of highly creative people. I was also interested to read your comment that to see relationships and patterns, and make unfamiliar combinations and connections, is the core of creativity. Why is uncertainty and ambiguity so important to the creative process? Creativity involves bringing forth something new. And, if it is new, then by definition it was unknown before. If you aren’t comfortable exploring the unknown then it’s unlikely that anything new will emerge. 11. Question: In your book you say that great minds ask great questions, and you also say that we can increase our problem-solving skills by honing our question-asking ability. What is your favorite way of ensuring you ask great questions? 12. Question: You say that da Vinci is generally recognized as the greatest genius of all time, but he made many mistakes and blunders. What is the lesson(s) we should learn from that fact? Like all great characters, Leonardo learned from his mistakes. He persevered despite adversity and failure. As he noted, all obstacles can be overcome by commitment. 13. Question: You have spent a lot of time studying Leonardo da Vinci. From what you know of his life and work, to what extent would you say he was a “lone genius”? The flip side of that question is how much of his work and achievements were the result of collaboration with others who lived during his time? Leonardo consulted with colleagues in the realms of mathematics, anatomy, music, optics and other subjects, but his breadth and depth of knowledge made him a singular figure in his time and for all time. 14. Question: You say that learning to draw is the best way to begin to learn to see and create. Why is that the case? Drawing develops awareness, which is the alignment of attention and perception. 15. Question: I am very interested in a statement you make in your book, which is if organizations want their employees to be creative, their physical environment must be designed to encourage creativity and innovation. What are some simple, practical things that businesses could do to encourage their employees to “think out of the box”? Liberate people from cubicles. How can people think “Out-of-the-box” when they are kept in one? 16. Question: You write that almost no one claims to get their best ideas at work; rather breakthrough ideas generally occur when one is relaxed and by oneself. Should we all learn the Alexander Technique, learn to meditate, or develop other methods of relaxation if we want to be highly creative and innovative? Yes! It's important to find a way to free oneself from conditioned, habitual patterns of tension. 17. Question: Who are your modern day heroes in the field of problem solving, innovation and creativity? Over the last 100 years I like Thomas Edison, Gandhi, Einstein, Morihei Ueshiba, Winston Churchill, F. M. Alexander, Wilhelm Reich, Viktor Frankl and Rollo May. 18. Question: Do you have any thoughts about how your approach to creativity and innovation could be used to help solve some of the major problems of the world, such as how to reduce international conflicts, poverty or climate change? Many of the people who are responsible for addressing these kinds of problems haven't been trained in creative problem-solving. I lived in Washington, D.C. for 17 years and did my best to share this knowledge with influential people. 19. Question: You have written eleven books, five of these were published after your book about da Vinci. These included books about Frederick Alexander and his Alexander Technique, and about Thomas Edison and his creative methods. Are you currently working on another book? We just published the Edison book so I'm very busy with interviews and book-related events but I’m also incubating four new book ideas. 20. Question: Earlier you were telling me that you have an exciting seminar that our IdeaConnection readers should hear about. Could you tell me about this seminar, which I believe you said will occur April 24th through 28th next year, in 2008, in Santa Fe, New Mexico, USA? I would be delighted to tell you about it. It is a four-day certification seminar that will be truly life changing and career-enhancing. It is for leaders, managers, consultants, trainers, educators, coaches, human resource and organizational development professionals, and people who are or want to be change agents or want to work on innovation teams. 21. Question: What will they learn? They will learn how to significantly enhance their skills as creative thinkers and innovators as they learn to help others develop their abilities to create and innovate. Graduates will become certified leadership coaches through the Academy for Creativity and Innovation Leadership. It is always a pleasure to explore the ideas about creative thinking and innovation of an accomplished author and professional speaker. I really paid attention when I learned that Michael Gelb was a fourth degree black belt in the Japanese martial art of Aikido (one would not want to cross a black belt). But I became very impressed to find out that he was at one time a professional juggler who performed with the Rolling Stones and Bob Dylan. After all Mick Jagger, (I better refer to his proper name which is Sir Michael Phillip Jagger) named my first sailboat “Jumpin’ Jack Flash”, which I shortened to J J Flash so it would fit on my transom. Well, Sir Jagger did not actually look at my boat and give it its name. He did inspire me when I heard him singing the song of that same name while I was sailing offshore on a beautiful moonlight night not long after seeing Whoopi Goldberg in the movie Jumpin’ Jack Flash. It was Mick’s great lyrics and singing, plus my memory of the oversized slippers Whoopi wore while trying to determine the computer password in order to help liberate an American spy who had been caught in the old Soviet Union without papers (or something like that — it was a long time ago). And so “Pacific Rose” was renamed “J J Flash” upon my reaching land. This is a serious digression, but it brings back great memories. Why would we want to learn to think like Leonardo da Vinci? We know he was more than just a great artist--inventor, musician and thinker come to mind. He is considered one of the “greatest” geniuses, perhaps the greatest, of all time. According to Michael Gelb, we can become more creative if we emulate the seven da Vincian principles listed below. In italics are relevant questions Gelb recommends we ask ourselves. Dimonstratzione: A commitment to test knowledge through experience, persistence, and a willingness to learn from mistakes. How can I improve my ability to learn from my mistakes and experiences? How can I develop my independence of thought? What is my plan for sharpening my senses as I age? How can I strengthen my ability to hold creative tension to embrace the major paradoxes of life? Arte/Scienza: The development of the balance between science and art, logic and imagination. "Whole-brain” thinking. Am I balancing art and science at home and at work? How can I nurture the balance of body and mind? Connessione: A recognition of, and appreciation for the interconnectedness of all things and phenomena. Systems thinking. It ties everything together. How do all the above elements fit together? How does everything connect to everything else? During my research for this article author Michael Gelb was very generous of his time and patient in responding to my questions. 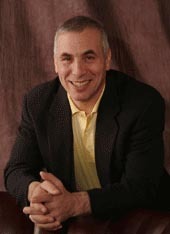 Michael Gelb’s Creativity and Innovation Leadership Seminar was held in April of 2008. Visit his website.